MISSION: To produce radically inclusive programming at the intersection of advocacy, education, and entertainment that cultivates and celebrates new work, emerging artists, diverse audiences, and fresh ideas. VISION: Transformative theatre that amplifies marginalized voices, illuminates untold stories, bridges disparate experiences, and energizes vulnerable communities. 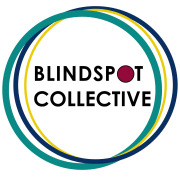 Blindspot Collective is committed to work that serves and represents those in the blindspot - people who may have never participated in the performing arts, never seen a reflection of themselves on stage, or never even seen a work of theatre. Since its founding in 2017, Blindspot Collective has produced work in partnership with The Old Globe, Diversionary Theatre, San Diego Musical Theatre, Bocón Arts, and other community partners. Most recently, the organization was the first theatre company to be awarded a performing arts residency at the San Diego International Airport. Other projects: Safa's Story, a forum theatre play for elementary and middle school students that encourages cultural sensitivity and racial injustice; Qulili, a documentary play based on the stories of local refugees; The Magic in this Soul, a new play about discrimination and resilience that won the Audience Favorite Award at the 2018 San Diego Fringe Festival; Danny’s Story, a work of Forum Theatre for high school audiences about transgender youth; Untold, a verbatim play about mental illness that won the Dunn‐Rankin Award for New Work at the 2017 San Diego Fringe Festival; and Hall Pass, an immersive musical about high school produced in partnership with the Playwrights Horizons Theater Company and Theater School in New York City. Would you recommend BLINDSPOT COLLECTIVE?